CoinOpCollectorForum.com • View topic - Can you identify the manufacturer of this coin flip? Can you identify the manufacturer of this coin flip? This area is to discuss trade stimulators. A trade stimulator is defined as a machine that does NOT pay the customer something of value (coin, token, etc.) when a winning combination is hit. 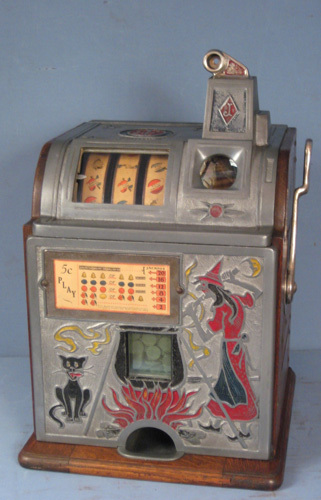 Can anyone identify the manufacturer of the penny flip machine shown here? Could it be a National or Great States machine? Also, I am in need of a cover plate for the gumball loading hole at the top of the machine. If anyone has a spare, or knows of a source, it would be appreciated.